Friday 3rd May - Friday started with an innocent walk down King's Road in the sun with my friend Mary. The plan was to do some window shopping and maybe buy a jacket but Mary's bus took forever, most jackets cost £200 and the shops started to close so it quickly turned in to another List evening instead. A quick check of my map told me that Tonteria and Barts were nearby, and so at about 7pm we wandered over to Tonteria in Sloane Square. Tonteria is an underground Mexican bar/nightclub depending on what time you go, with better than average bar food available too (doesn't everywhere serve Squid Ceviche?). It's another Guy Pelly club (Mahiki, Whisky Mist) which isn't normally my idea of a good night out, but when Tonteria is in laid-back bar mode, it's a great little place. Look up to see the Tonteria Express which chugs around serving tequila to VIPs - a seriously moustachioed barman gave it a lap for us. You can order a sharing cocktail that comes in one of the train carriages though it is apparently broken at the moment. 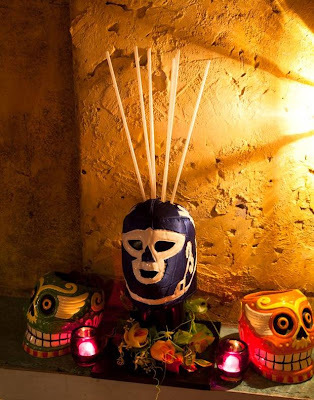 There are numerous silly sharing cocktails from Lucha Libre masks to Mayan pyramids, but there are more sensible Margaritas and Mexican beers (Negra Modelo always goes down well) if you want to leave with some money to spare. If you have £5,000 you can buy yourself their most expensive bottle of Reserva del Alma tequila. On the menu it says that there only two bottles, but when we asked our barman he explained that there was now only one left because one of his colleagues unforunately smashed the other! The Sloanes started to arrive as we were finishing our drink so we decided to move on. Arrive early for a fun, atmospheric drink and stay later if you can bear the clientele! Our next stop was Barts near South Kensington - The "Worst Kept Secret" bar hidden somewhere on Sloane Avenue. I will not reveal the exact location as finding it is half the fun! Mary and I both had different Google Maps results for the location so we snooped around the street for a bit, trying to decide which unmarked door might lead us to the bar. After watching a shifty looking lady leave from a blue door which seemed to match Mary's location for the bar, we decided to buzz. We were instantly let in which led us to believe we were in the right place. Seconds later, however, we discovered that we had just been let in the chefs' back entrance for a Japanese restaurant. One kind chef pointed us in the right direction and we were more successful on our second attempt. We hadn't booked so we weren't sure whether there would be space, and some reports online suggest that you might have difficulty getting in unless you are in a girl heavy group, but we were welcomed and given a table to sit for as long as we could hold on to it. It's a lively little bar with a fun dressing up box and all sorts covering every inch of the walls. Barts is part of the same group as Bunga Bunga (Berlusconi karaoke pizzeria) and Maggies (Thatcher themed club where they play her speeches in the toilets) so the ridiculous sharing cocktails served in giant teapots are no surprise. What is a surprise though is that they serve Samuel Adaams beer by the Stein! I'm sold. Where most bars of this ilk would serve up some average bottled beer for £4.50, Barts give you a 1 litre Stein of premium beer for under £9! Natalie joined us as we messed around with various Cinco de Mayo themed items from the dressing-up box. 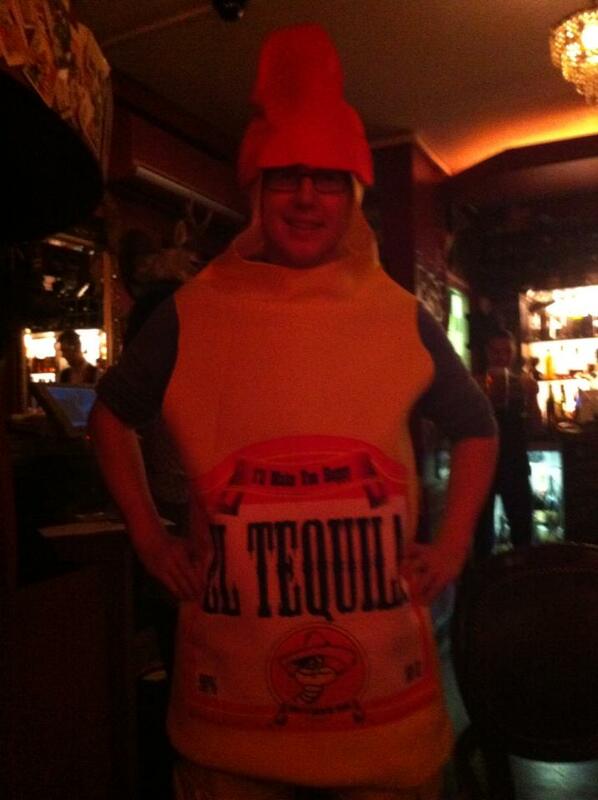 See the rather special Tequila bottle outfit below. It wasn't a crazy night as two of us were working early the next day, but it was a very successful unplanned jaunt around South Ken and Sloane Square. 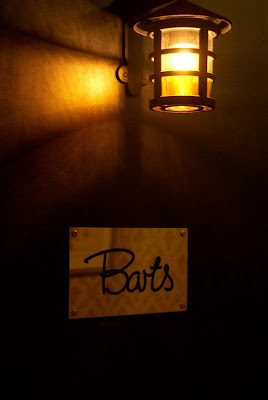 Now I know where Barts is (and that they have a solid beer option), I will return confidently with more friends! 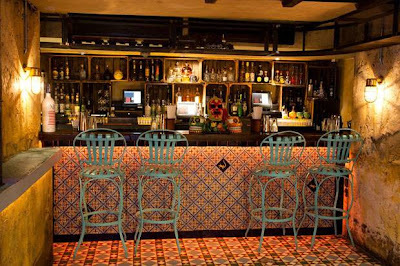 Watch out for two new bars from the same team that are opening soon. 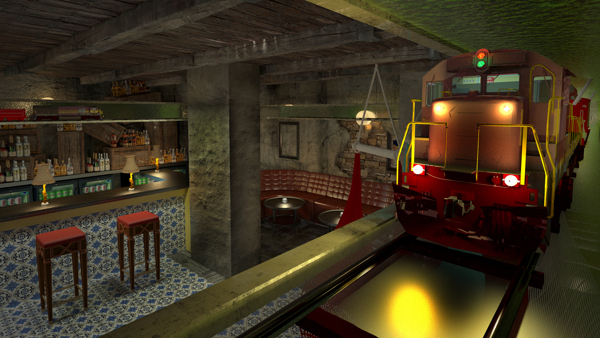 Mr. Foggs is a Phileas Fogg themed Mayfair bar opening on May 22nd, and Disco will apparently be 70s Manhattan, reborn in Soho. 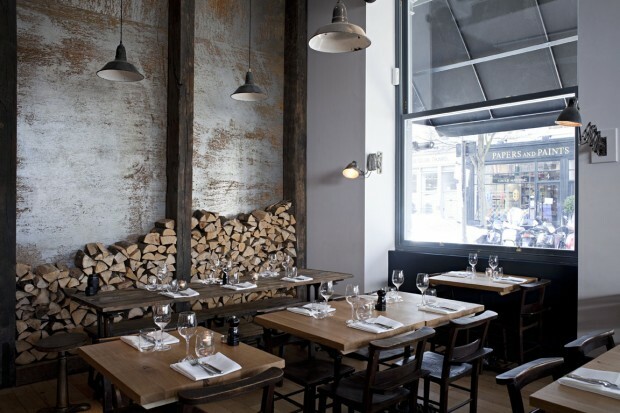 Sunday 5th May - Just a quick mention for the new Goat restaurant that has opened in the old Goat in Boots site on Fulham Road. It's apparently a "New York & Italian restaurant and cocktail bar" so when I popped in with my friend Harriet on Sunday we had to have a bit of both. There is a cosy bar upstairs where you can have a pre/post dinner drink - our cocktails were excellent, and the well put together list makes choosing a drink a difficult choice. My Bresaola based pizza and Harriet's calamari were also delicious. Why are you talking about a nice restaurant I hear you cry? Because there is a secret concealed upstairs, of course! Due to short staffing that night it was sadly shut, but after a quick word with front of house they agreed to show us around anyway. 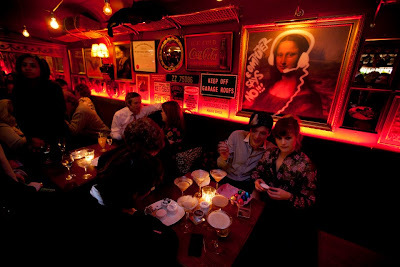 Hidden away is a tiny bar called the Chelsea Prayer Room complete with unbranded "speakeasy" spirit bottles behind the bar, and menus tucked away in hymn books. Our host seemed to think we had friends in high places as he showed us a secret exit that leads straight to the street in case any of our friends need to avoid being seen. We tried to play along and I think just about got away with it. If anyone knows anyone famous that would like to go to a bar in Chelsea with me, please get in touch. I will hopefully report back on it soon once I have had actually had a drink there! Head along to the restaurant anyway as the food is fantastic, and see if you can sneak yourself in upstairs. Thanks to the staff for taking the time to show us around. I have (for the first time!) scrapped my normal chronological order so that I could mention Goat in the same place as the two other places in Chelsea. There is still a post to come on a great day out around London Bridge and Rotherhithe on Saturday 4th. I have also added new links to the right hand side of the blog (though not if you are viewing it on a mobile) so that you can choose old posts that cover particular areas of London - I hope some find this useful!